Comps Start Today | Team Alzen! Around 9 am I’ll be emailed three essay prompts/questions. I have until next Friday to write an 8-page essay responding to each prompt. About a week after that, I’ll sit in a room with the three faculty members who wrote the questions and answer questions about/defend my essays. This is supposed to be the step after you finish classes and the gateway to writing your dissertation. I’m doing things a little wonky because I still have three classes to take after this semester, but you get the idea. Before I do that, a moment of thanks for my amazing grad school friends. Aside from just general encouragement, I’ve received several encouraging emails and links to motivational music. One sweet office mate who took comps last semester gave me a chocolate bar because she said that helped her get through her the process. Then, I discovered this gem as I walked into my home work space this morning. 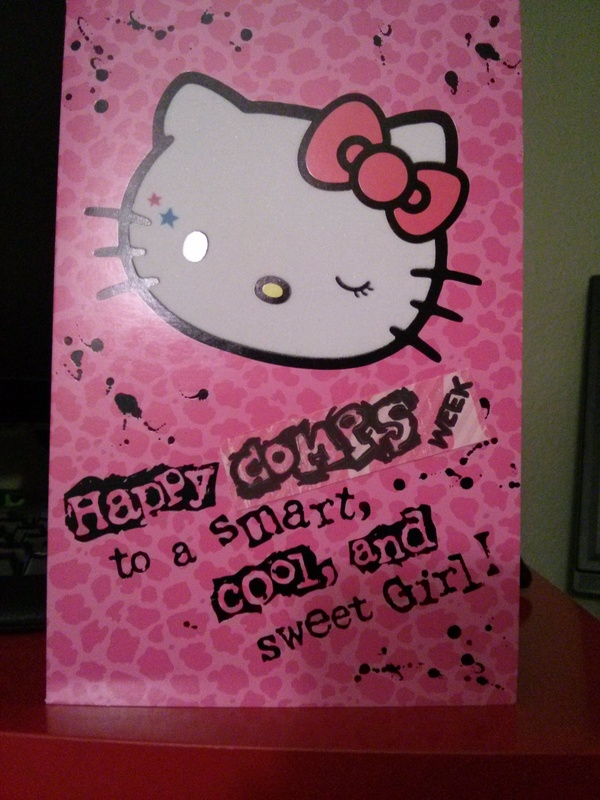 My thoughtful roommates acquired this AWESOME Hello Kitty card that they customized just for me. It has stickers inside, people. These folks know me and are just so thoughtful. Glad I came here, glad I met these people, and glad to be at this stage in my graduate career. Am currently feeling good about my exams. Will give you an update in the coming days.